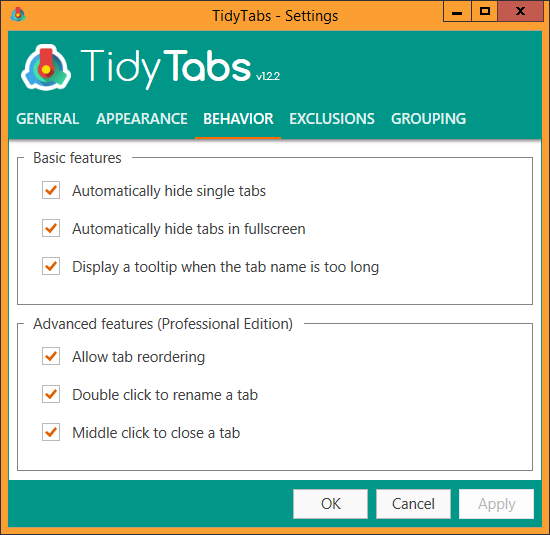 Here you can configure the behavior of the tabs added to your applications by TidyTabs. To access this screen, double-click on the tray icon, at the bottom-right corner of the screen, and click on BEHAVIOR. Automatically hide single tabs: when enabled, the tab of ungrouped windows are hidden in order to reduce the visual noise. The hidden tabs appear when you mouse over them. The default value is enabled. Automatically hide tabs in fullscreen: when enabled, the tabs of maximized windows is placed at the middle of the title bar and is be hidden until you mouse over it. The default value is enabled. Display a tooltip when the tab name is too long: when enabled, if the caption of a tab is too long to fit entirely, the entire text is displayed in a tooltip when you mouse over the tab. The default value is enabled. Allow tab reordering: when enabled, the tabs in a tabbed group can be reordered by dragging them with the mouse. The default value is enabled. Double click to rename a tab: when enabled, the tabs can be renamed by double-clicking on them. The default value is enabled. Middle click to close a tab: when enabled, the windows can be closed by clicking with the middle mouse button on their tab. The default value is enabled.